Love, love, love the skirt – not so keen on the french seams myself. While I appreciate them as a technique – they are fiddly! Very nice sewing! I have always wanted to make a quilt too! My sewing always begins with calling my mum to come over and thread the sewing machine and wind the bobbin. Then it proceeds to her sewing the whole set of curtains, little girl’s dress or Halloween costume. French seams are usually amongst the things I just request, “make it this way, mum”. I haven’t dared request a whole quilt though! At my age, I am sure this is getting a bit tiresome for the lady, but she did just retire. And she doesn’t knit anymore, so I’ll make it up to her! You’ve got mad sewing skills! I’m still trying to convince myself to line a tote bag, one of the simplest tasks in all of creation! 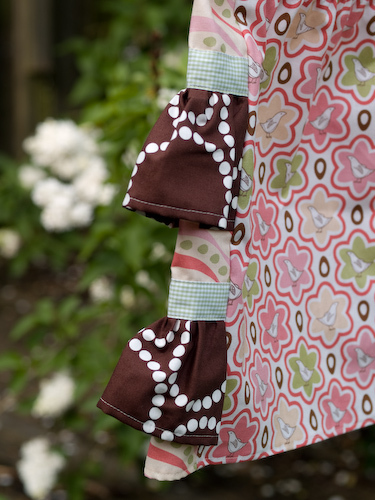 You do have incredible sewing skills and Kira loves her skirt! Thank you again for taking the time to make such a beautiful gift.